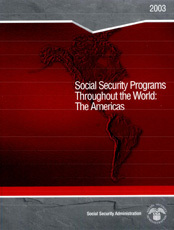 This issue completes the first four-volume series of Social Security Programs Throughout the World. In this new format, each volume focuses on a specific region of the world: Europe, Asia and the Pacific, Africa, and the Americas. The volumes are published at 6-month intervals over a 2-year period. The next issue (Europe), which will begin the second series, will appear in September 2004. Social Security Programs Throughout the World is the product of a cooperative effort between the U.S. Social Security Administration (SSA) and the International Social Security Association (ISSA). Founded in 1927, the ISSA is a nonprofit organization bringing together institutions and administrative bodies from countries throughout the world. The ISSA deals with all forms of compulsory social protection that by legislation or national practice are an integral part of the countries social security systems. Previous editions of this report, which date back to 1937, were issued as one volume and were prepared by SSA staff. With the introduction of the four-volume format, however, the research and writing has been contracted out to the ISSA. The ISSA has conducted the research largely through its numerous country-based correspondents, as well as its Social Security Worldwide Database and a myriad of other types of data that must be drawn together to update this report. Members of the ISSA's Information System and Databases Unit analyzed the information and revised the publication to reflect detailed changes to each social security program. Social Security Programs Throughout the World is based on information available to the ISSA and SSA with regard to legislation in effect in July 2003, or the last date for which information has been received. SSA staff members were responsible for technical and editorial assistance and production. Barbara Kritzer served as technical consultant and provided overall project management. Emil Loomis designed the report and produced it for publication. Sherry Snyder edited the report, with assistance from Celine Houget. Laurie Brown prepared the Web versions of this publication.